Aryan Kaganof added a fillip to the recent Poetry Africa (2015) that took place in Durban, South Africa. Kaganof is arguably South Africa’s most versatile and resilient cultural activist. He is an eclectic film-maker, novelist, poet, fine artist and an indefatigable blogger. 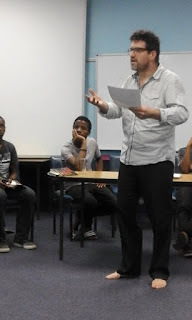 Pix shows Kaganof rendering a piece inspired by Mphutlane wa Bofelo's work at the poetry exchange programme. Venue was the Workers College.